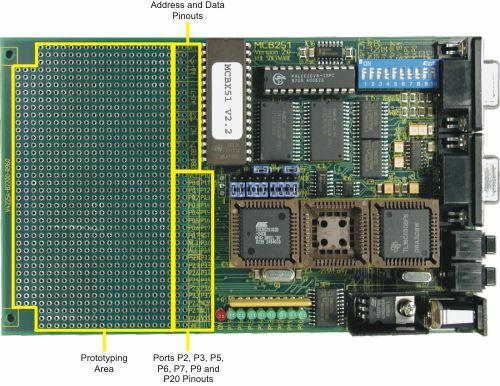 The prototyping area provides blocks for connecting the address and data lines, and ports P2, P3, P5, P6, P7, P9 and P20. Refer to DIP Switches for the pin-out of the CPU and bus signals. Since the MCBx51 supports both the Page mode and Non-page mode you should connect memory-mapped devices directly to the data bus DB0-DB7 and A0-A15.